The time has come to take aim and pick up the pace with DC Comics Dice Masters: Green Arrow™ and The Flash™. Showcasing Jay Garrick™, Barry Allen™, Green Arrow™, Felicity Smoak™, and a host of other heroes never before seen in Dice Masters, this is a cannot-miss set! If you prefer the villainous characters, Gorilla Grodd™, Merlyn™, Clayface™, and Giganta™ won’t disappoint you! For more information about future releases like this one, maybe you could even consult Rip Hunter™’s Chalkboard! 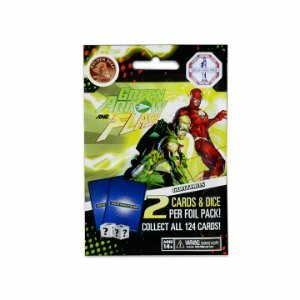 Each DC Comics Dice Masters: Green Arrow and The Flash Foil Pack contains two cards and two dice that players can add to their Dice Masters collections! Introducing more than 30 heroes and villains (and their dice! ), DC Comics Dice Masters: Green Arrow and The Flash will be sure to shine bright as a highlight of your Dice Masters collections! This is not a stand alone item. A copy of any Dice Masters Starter Set is required to use this item.